Gone last night at BankAtlantic Center in Sunrise, FL were former fly and super flyweight world champion Vic Darchinyan's usual advantages of height, strength and power as the Aussie hard man moved up to bantam to challenge IBF titlist Joseph Agbeko. Filling the void was the taller, stronger and bigger punching Agbeko, who had refused to be intimidated by Darchinyan's trash talk during the long media campaign leading up to last night's clash. 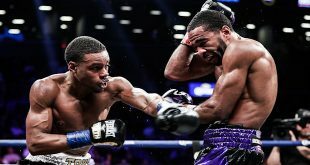 Agbeko also refused to be moved a single inch by the force of Darchinyan in the ring, handling the southpaw challenger's bull rushes with good footwork and counters, with a solid chin that held firm whenever the overhand lefts and right hooks of Darchinyan connected. 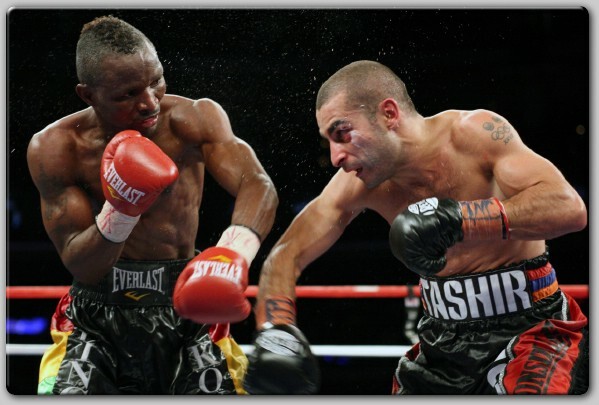 The champion's awkward, odd stance and mastery of angles presented Darchinyan a difficult target to hit but what really gave the "Raging Bull" trouble was Agbeko's lead right hand. Thrown with perfect timing from a forward leaning crouch, Agbeko simply nailed the oncoming Darchinyan countless times with the right hand, particularly after the challenger's eyes became cut and swollen. 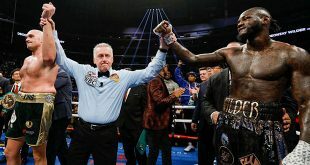 The warrior from Ghana made a mockery of Darchinyan's constant pre-fight vows to produce a KO and defeated a fighter that many considered one of the sport's pound for pound best by scores of 117-111 and 114-113 twice. Agbeko lived up to his "King Kong" nickname while improving to 27-1 (22). Darchinyan loses for just the second time to fall to 32-2-1 (26). The undercard featured three world title eliminators. Former IBF cruiserweight king Steve Cunningham, 22-2 (11), won the right to rematch IBF titlist Tomasz Adamek, who also won this evening in a title defense in New Jersey, by outboxing ex-WBC beltholder Wayne Braithwaite, 23-4 (19), enroute to posting a unanimous decision. 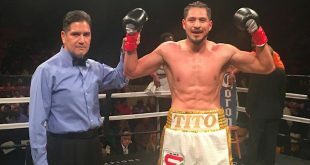 Lightweight Antonio DeMarco, 22-1-1 (16), annexed the top WBC spot by KO'ing Anges Adjaho, 25-2 (14), in the ninth and welter Ivan Kirpa, 24-1 (15), posted a wide points verdict over Miguel Angel Rodriguez, 29-4 (23), to win a WBC welterweight eliminator.